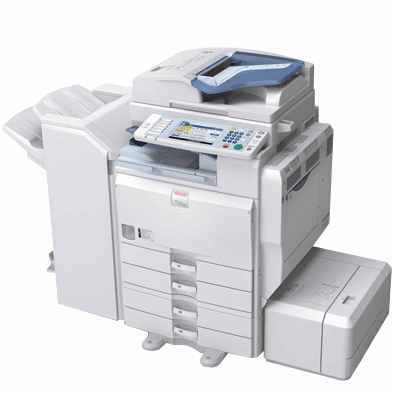 The Ricoh Aficio MP 5001 is the base model in a series of monochrome laser printers that also includes the 5001G and 5001SP. The MP 5001's quick and impressive multifunction design will help support robust workflows, printing at a maximum speed of 50 pages per minute. 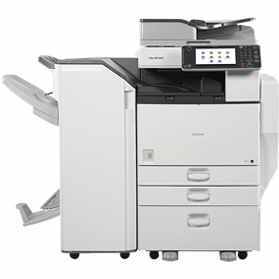 A number of other attributes make this unit a good fit for medium offices trying to increase productivity, from its flexible print, scan, copy and fax functionality and long-lasting Aficio MP 5001 printer toner to its handful of upgradable features. While the MP 5001's size of 26x27x36 inches makes it a bulky machine, this build enables it to incorporate versatile 4-in-1 features that can easily be shared among multiple users thanks to its wired and wireless network connectivity and optional Bluetooth. 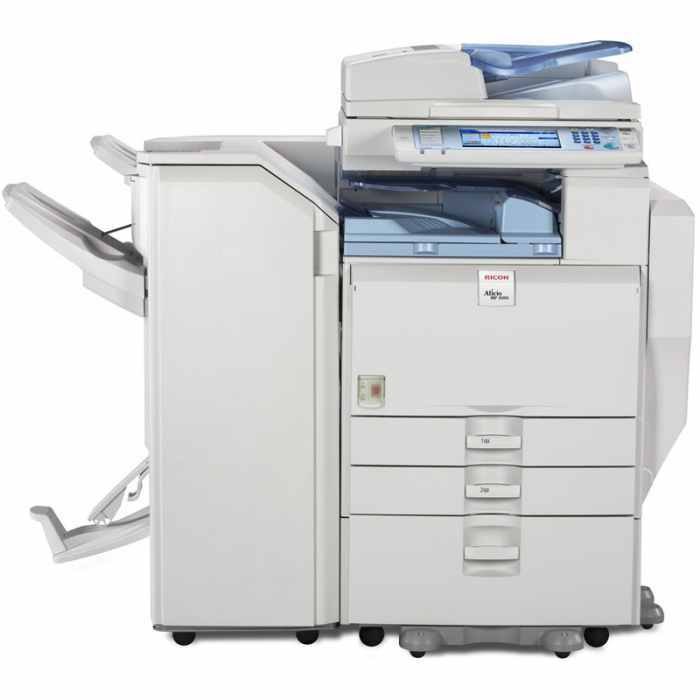 Standalone copying and faxing is also an option thanks to its flexible control panel, which includes a color touchscreen LCD that offers animated user guidance, access to popular functions and alerts on jobs in progress and Ricoh MP 5001 toner levels. Users will also be able to use keys to duplicate a job up to 999 times, select a fax destination and set speed dials. The MP 5001's generous built-in media input will enable it to store up to 1,200 pages at once and support a range of media types, as well as effortlessly switch between trays. Those expanding their volumes can do so by adding on its optional input trays and increasing its total capacity to 4,400 pages. Other paper features include a 100-sheet dedicated automatic document feeder for unattended scanning and faxing, as well as finishing options like a stacker, staple tray and booklet maker. Since it can't handle color projects, this device is ideal for a range of internal monochrome jobs, printing text and graphics with clear detail and a maximum resolution of 1200 dpi using Aficio MP 5001 toner. 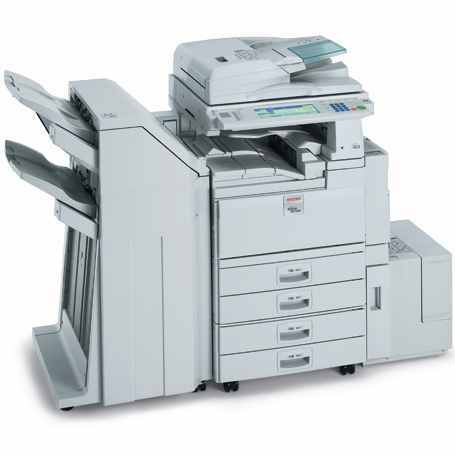 Jobs duplicate with a true reproduction of the original document, while the device can fax with a resolution of 400x400 dpi and scan jobs with a resolution of 600 dpi. 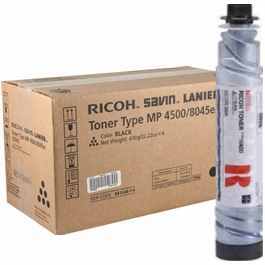 While units with multiple toners are often expensive to use, this machine helps reduce costs by operating with only one black Ricoh MP 5001 toner cartridge. With yields of up to 30,000 pages for Ricoh MP 5001 toner cartridges, this machine should be able to sustain high volume demands without busting the office budget. 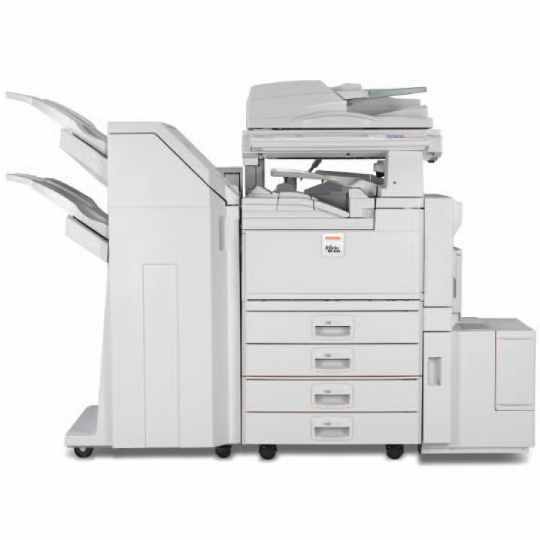 Many office devices on the market are advertised as having the ability to increase users' workflows without becoming expensive, but the MP 5001 is among the few that can live up to this premise thanks to its high-capacity supplies and expandable media input capacity. Benefiting further from an easy-to-use interface, flexible connectivity and its bundle of dedicated features for each function, this machine can easily be considered one of the top picks in its class of all-in-one printers.